The lift at Simon De Senlis Court has been broken down for over a month, trapping some residents upstairs. 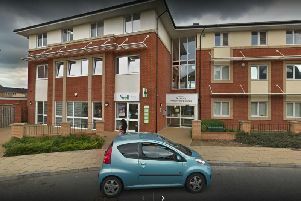 Residents at a Northampton care home have called living there "like a prison with no bars" after a broken lift left some of them trapped upstairs for over a month. Elderly pensioners at Simon De Senlis Court, in Robert Street, have been unable to freely leave their flats for over a month after the only lift broke down in October. But it only adds to the problems residents have faced year after year at the £600-a-month sheltered accommodation, including faulty heating throughout winter and leaking roofs. Now residents say they have had enough and are pointing to London-based owners, The Hyde Group, as the start of the troubles after they took over in 2013. 82-year-old Allan Myers, a retired engineer, said: "I couldn't make my hospital appointments with the lift out. I haven't gone out in over a month. It's like living in a prison with no bars. "Many of us aren't able to take the stairs and we're stuck. Them in London just forget about us." It comes after the broken lift was seen by a technician last week (November 13) after a three-week wait - only for it to break down again 20 minutes later. Eileen Hadland, 92, said: "You think it can't get any worse and then it does. "This used to be a beautiful place to live. It all started four years ago when Hyde Group took over. They treat us with no courtesy or respect. They are not interested in the old people." The head of housing for The Hyde Group, Benjamin Bello, said the company is now seeking to replace the entire lift, and has now installed a stair lift. But residents are not satisfied. The stair lift means less-mobile residents arrive on the ground floor without a walker or wheelchair to get out the home. One 82-year-old resident has had to carry his 84-year-old brother up and down the stairs while lift is out. He said: "Even if he used the stairlift, he can't walk to his scooter in the garage. With the lift, he can just take his scooter out his flat to the ground floor. "Besides, you would think a stair lift should have been there a long time ago. "It's not dignified living here some times." Last winter, some residents spent all four months of the season without heating and had to warm their homes with electric heaters. Some electricity bills running over £120 in addition to their rent. Then, Hyde Group offered £50 in compensation for the faults that winter. Now, some residents again say they have been sitting in cold flats and again have had to use with personal heaters. They fear another winter without heating. Hyde Group says they are now replacing the home's thermostats "which will be easier to use". Another resident said: "I feel sorry for the staff. They are trying their hardest. They write to the Hyde Group so often. But them in London aren't bothering." Simon De Senlis Court celebrates its 20th anniversary on November 27. The home's residents' committee wrote to the Hyde Group to ask for help funding a celebration party. Mrs Hadland said: "They didn't even have the courtesy to write back. They just left a voice message with the manager saying they don't do that anymore." The residents are planning to use the anniversary to speak to the Mayor of Northampton Gareth Eales about their troubles.